For the last couple of days, flying rapidly across one of the two fields we have to ourselves on this still blissful campsite, we’ve seen hoopoes. The hoopoe is surely one of nature’s strangest avian creations, resembling a clown with a mohican hair-do. Along with the fact that man’s windpipe and oesophagus sit side by side such that food often attempts to enter the lungs, hoopoes are a fine argument against the existence of a god. Neither is a design befitting an omnipotent being. Long live Darwin. Anyway, by observation between showers, we spotted the crested little tykes visiting the roof of one of the sanitaires blocks nearby our pitch, a block that is currently closed pending the high-season onslaught. 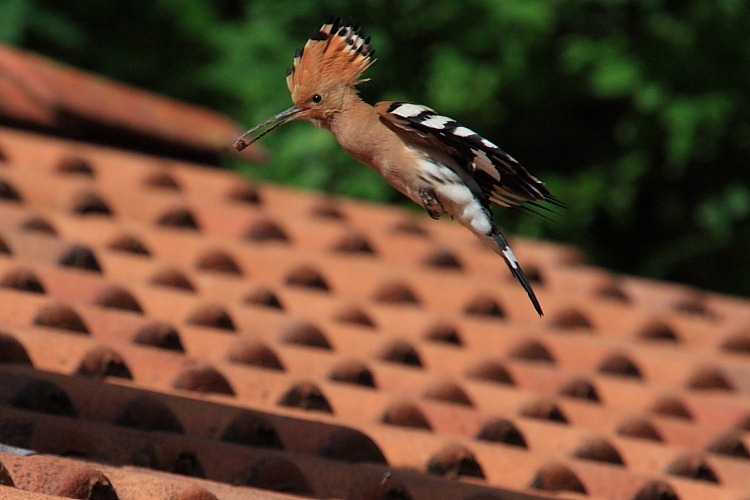 Our bird guide says that hoopoes will nest “in the foundations of your house” which seems rather more curious than dangerous; a hoopoe – a little smaller than a blackbird – is not large enough to undermine any foundations. This pair, we think, is actually nesting in/on the roof of les sanitaires. Their nest is not visible but appears to be behind the top edge of a roof sky-light window, judging by their activity. With adults looking this weird, I’d expect young hoopoes to look decidedly odd. Unfortunately, I suspect that eggs are still being incubated and we wont be here long enough to see them fledge. Saw your blog mentioned on Boonsong’s site and thought I’d stop by to say hello. Nice to have met you, I’ve enjoyed visiting.